Our skin tells who we are. Skin is the best storyteller of a woman’s journey, from scar to sunburn. I know women who have stretch marks and scar after giving birth. Some are shy to show it so they don't wear swimsuits anymore. They didn't realize the scar actually tells amazing stories of battle and success. Scars are reflections of what we've been through. AVEENO, an imported mild and dermatological tested skin care product has finally arrived in the Philippines brought by a leading company, Johnson & Johnson Philippines. It was launched few days ago at Blue Leaf Pavilion in McKinley Hill, Taguig. Jennifer Aniston is AVEENO's international brand ambassador. But we are proud of our Filipina Aveeno ambassadors - Nikki Gil-Albert, Christine Jacob-Sandejas, and Jaymie Pizarro who shared their #naturallybeautiful skin story during the launch. AVEENO contains Active Naturals such as colloidal oats which is clinically proven to sooth dry skin. For more than seventy years, AVEENO has been harnessing the power of all-natural and organic ingredients such as colloidal oats and combining them with breakthrough sciences to deliver skincare solutions that effectively cleanses, moisturizes, and protects all skin types while being gentle enough for everyday use. Dry and irritated skin has never been my problem but that doesn't mean I don't have to take care of my skin. I still place the same amount of care by applying only gentle and clinically tested products. Even if I have scar in my tummy due to exploratory laparotomy I had back in 2014, I still wear bikini and swimsuits when going to the beach. 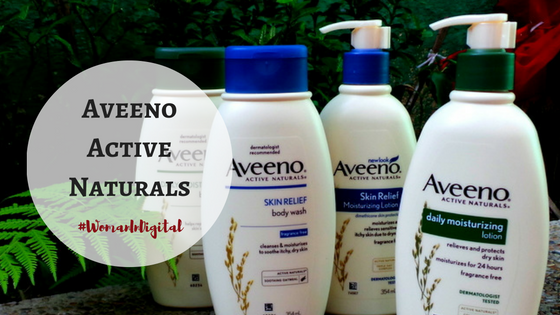 I received both the Aveeno Naturals Skin Relief and Aveeno Daily Moisturising collection and started using the Skin Relief lotion and body wash.
AVEENO’s Active Naturals line is formulated using oat. In my trip to Somerset Alabang Manila, I brought AVEENO's Skin Relief Body Wash and Lotion since I'm spending more time in the pool, swimming and too much sun exposure could dry and sometimes irritate the skin. I just love it's mild scent. Just a small amount, it easily spreads on the skin. I love giving my skin natural moisturizer. I prefer products that are mild and has feminine scent. Aveeno Skin Relief Body Lotion is non-greasy but doesn't have that floral scent. Still it has a nice scent si even hubby could use it. I could feel the difference when applied on my shoulder, neck, nape and areas prone to dryness like in between fingers and it provided instant moisture and relieves from dryness. Beauty empowers us to achieve our goals in life so we must feel comfortable in our own skin. Thanks to J&J, Aveeno is now in the Philippines!